It is no secret that I have a passion for all things dance hall and dub step (those fly girls I used to work with in London will vouch for me) this being said, when I decided to throw this soiree I wanted it to be lively, I wanted colour, I wanted sublime culture and I wanted the ghetto rawness of Kingston Jamaica and the explosive atmosphere of Notting Hill carnival. 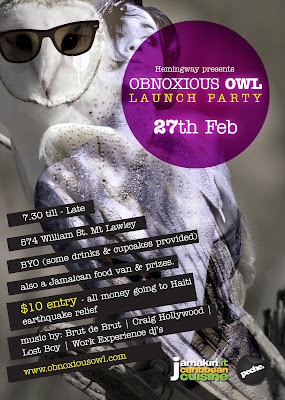 So when Hemingway attended the recent Raggamuffin festival and saw Kazz from Caribbean kitchen dishing out Jamaican delicacies, he jumped on him to come feed the faces of my bodacious ‘owlettes’ and provide the aroma to set the tone of the night. So hear me now and meet Kazz…he’ll be bringing the flavas to you…The people of Haiti would be proud. SO KAZZ, YOUR HERITAGE IS JAMAICAN, BUT IS THAT A SOUTH LONDON ACCENT? No! North London loveIS THERE MUCH OF A JAMAICAN COMMUNITY IN AUSTRALIA? NAMELY THE WEST COAST? Yeh mon nuff. We are in the process of forming a Caribbean Association in WA, we have people from all parts of the Caribbean now living in PerthWHAT ARE YOUR FAVOURITE COLOURS? WHAT WONDERFUL FLAVORS WILL BE ON OUR PALETTES AT THE PARTY? Jamaican “Jerk BBQ Chicken” (is a secret blend of herbs and spices cooked over a Wood or charcoal fire. A marinade of hot-pepper as it’s key ingredient) wid Dumplins (A dough mixture is shaped into medium-size balls and fried in hot oil. Wid some Rasta Four Bean salad. Jamakin-it nice!!!! Were We Bring de flava to yuh!! WHAT DO YOU THINK ABOUT THAT GIRL, THE OBNOXIOUS OWL? Well nice…like chicken rice haha. 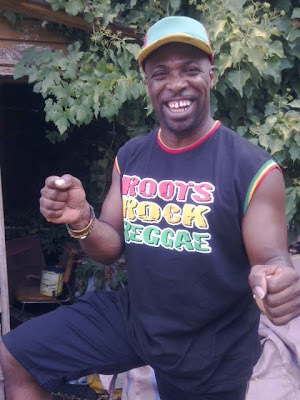 For bookings email Kazz at bookings@carribbeankitchen.com.au or check out his website here.